So I would agree with many of the reviews I’ve read of this book. 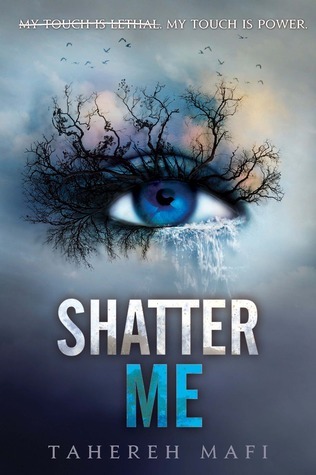 Shatter Me is a Romance masquerading as a Dystopian novel. Did I care? Obviously not. I flew through this book. There was never a dull moment, the writing was fascinating, and the characters were well-developed, earning it a rare 5 Star rating from me. I loved it from that point on. The writing style is so clever unique (see what I did there? ), and even though it annoyed some reviewers, I LOVED it. The way that Mafi has words crossed out gives you a deeper look into Juliette’s psyche, which I thought was awesome. Juliette was such a well-developed character, and I can’t wait to see how she progresses through the rest of the series. You really see her struggle with how she sees herself, especially because she’s been so abused by…well, just about everyone on the planet. Because it is a Dystopian novel, there is a group called The Reestablishment that is trying to pretty much take over the world and ‘fix’ all the problems plaguing humanity. Warner, a military leader in said operation, knows of Juliette’s curse gift, and wants to use it for his own purposes ands he wants her for himself. But Juliette soon learns that there are others who want to help her, rather than just use her. Adam is now on my list of top book boyfriends. This boy is wonderful and adorable, and I loved his and Juliette’s tumultuous relationship. Seriously though. I oohed and ahhed over their relationship the whole way through, and I can’t wait to see what develops with the two of them later on. The love-triangle in Shatter Me was uber creepy. Warner freaked me out, and if anyone is Team Warner, I am seriously hoping something comes to light later that would explain that bout of insanity. Usually I can see both sides of a love triangle, but this one is a mystery to me (unless something profound happens later on that I haven’t read yet). He was insane. I thought he was a great villain, and I was glad Juliette was repulsed and creeped out by him. I hope that doesn’t change in the future. He’s crazy. So…lets talk about the metaphors. This was another thing that reviewers mentioned negatively. For the first half of the book, the metaphors were a tad ridiculous and far to frequent. I found myself cringing a few times just at how many dramatic metaphors there were. But then we really got into the main conflict, and there were fewer of them; obviously they didn’t bother me too much, or I wouldn’t have given the book 5 stars. But sometimes, the metaphors were laughable. Really just because there are a plethora of moments where the metaphor lasts for half a page, and the reader is like….well…she’s obviously trying to tell me something…sometimes they are used PERFECTLY to accentuate Juliet’s confused feelings. Other times they made me giggle because they were slightly ridiculous. But I ADORED this book. I really hope Mafi plays up the Dystopia elements as the series continues, because that will only strengthen an already massively entertaining book. If you love YA romance with some Sci-Fi/Dystopia mixed in, with a unique way of story-telling, this book is DEFINITELY for you. This entry was posted in Book Reviews, YA and tagged Sci-Fi/Dystopia, YA.